The spring Model United Nations High School State Conference met at the Humphrey School Thursday. Some 300 students in grades 7-12 participated in classroom and simulation activities on promoting access to renewable and sustainable energy and poverty reduction. As delegates representing countries from the UN's 193 member states, they simulated the United Nations General Assembly in debating, drafting, and passing resolutions while working together to solve these pressing world issues. More on this from Brandon Gorringe: http://www.unamn.org/blog. Photo from Brandon Gorringe. Esmatullah Sahebdil who spoke about resettlement issues facing countries dealing with both refugees abroad and displaced persons internally, with a focus on Afghanistan. 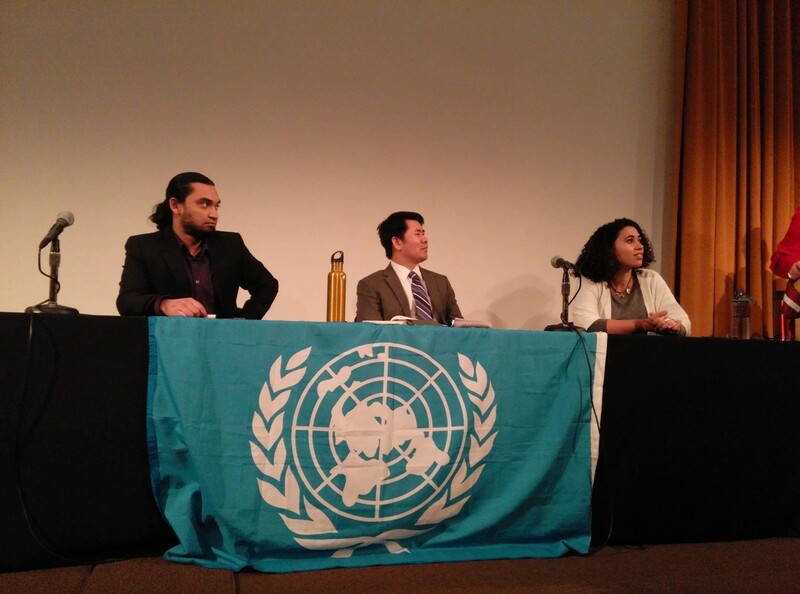 Humphrey School's Pepe Wonosikou, program associate in the International Fellows and Scholars Program (IFS) coordindated the School's role in this event and worked with volunteers and staff of United Nations Association of Minnesota on the program. Humphrey School thanks IFS volunteer Brandon Gorringe for assisting throughout the event.